George Oakley opened the scoring for Caley Thistle. George Oakley found the net for Caley Thistle as they drew 1-1 with Nairn County at Station Park. A close-range finish from Oakley gave the Scottish Championship side the lead in the first-half but Max Ewan levelled the scores before the interval. John Robertson started trialist Grant Nelson, as well as first-teamers Carl Tremarco, Jamie McCart, Oakley, Zach Elbouzedi and Jordan White. Nairn County started new signing James Kendall between the posts. Kendall was called into action seven minutes in with a smart reaction stop, denying White after he steered a header goalwards from Oakley’s flick-on. It would be Oakley to break the deadlock on 14 minutes, diverting Elbouzedi’s corner in at the near post. Nairn stopper Kendall was busy in the first half but made a number of key saves, tipping over Elbouzedi’s free-kick over and back-pedalling to keep Harry Nicholson’s cross-shot out. 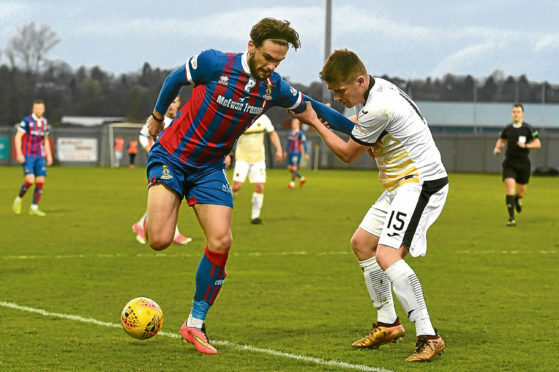 The home side levelled after the half-hour when Ewan collected Kendall’s clearance in the left channel, ahead of Caley Thistle goalkeeper Daniel Hoban. Ewan kept his composure to lift the ball over the stranded Hoban and restore parity. Dylan Mackenzie spurned a glorious chance to put the Wee County in front just before the break when he met Kenny McKenzie’s cross at the back post, but he skewed his effort well wide. At the other end Kendall superbly denied White from a one-on-one. Hoban was more active in the second 45 as he kept out Jordan Macrae and Jack Maclean while at the opposite end Oakley came close to a second with a header that hit the bar. Kieran Chalmers and White had opportunities to put the Caley Jags back into the lead in the final 10 minutes but failed to capitalise and two smart saves from Dylan Maclean, denying Oakley and Elbouzedi, ensured Nairn left with a creditable draw.